This image is a screenshot from my computer. 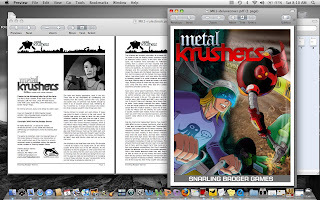 Opened on my desktop are the rule book and cover art in PDF form of the fascinating table-top microgame Metal Krushers from Snarling Badger Games in Oshkosh, Wisconsin. Games of any sort are not my area of expertise and I don't think I have ever talked about one in this blog before. I mention this one and the company that produces it because Adam Loper of Snarling Badger is a dear old friend and I was out of contact with him for too long until very recently when we met up again via Twitter. Way back in the early 1990s, Adam and his pal Peter Spahos were playing a certain game and were finding fault with its rules and playability. Inspired to devise their own, better game, they went to work and came up with their first product, BattleBots (no relation to, and in fact came before, a certain TV show and its companion game). You can read the whole history and learn about their other products, including the version now known as Metal Krushers by visiting their website. Looking over this game, I can say (as a non-gamer) that it is easy to learn and seems totally playable and fun. Back in the 1980s, I acquired a couple of Star Trek microgames made by (I think) FASA and they were totally not fun and not very playable (same problem, as I recall, with their role-playing games, too). Snarling Badger's products are much better. So if you are into microgames, get yourself to their site and start buying stuff. They even have t-shirts! Adam and I went to high school together at Oshkosh North and were great friends throughout those years. We worked together on the student newspaper and I enlisted his talent on the Trek fanzine The Alternative Warp. Adam is a terrifically skilled artist, and he produced the front covers and nearly all of the interior art for most of the run of zine (I think about 20 issues, including the really crappy final two or three editions, for one of which Adam drew a spectacular image of the Alternative Warp Tower falling into ruin). He also wrote and drew several installments of a Trek-parody comic strip that filled the back cover of many of the issues. As I recall, the story-line of the comic reached its climax when the shadowy mastermind behind the villainous robotic menace is revealed to be...the Disco Man (originally a goofy piece of clip-art that Adam found in a clip book in the school newspaper office depicting a mustachioed, big-haired dude in a leisure suit--that's the sort of thing we got into back then, and yeah, it's still funny). He lives in Oshkosh with his wife Emily, and can also be found on his blog Atom Smashing. Oshkosh, huh? I knew you were from around the same area as me, but I had no idea how close. I'm originally from Fond du Lac. The Snarling Badger site doesn't look like its been updated in over a year. Are they still making games? Yeah, they're still making stuff currently, though I did notice also that some of the stuff on the site (like the convention schedule) has past its date. I believe, however, that the products are all available and there is likely some new stuff forthcoming. Sorry, I was gone a good portion of the weekend. Off the grid, mostly. Yes, we're still making games, and that's partly why the web site hasn't been updated lately: we've been head-down, working on our next two games and going to local conventions. Also, I'm a bit lazy, as I'm a web developer in my day job, and then I'm sometimes not in the mood to do web design when I get home. Something about the shoemaker's kids not having any shoes, or something like that. 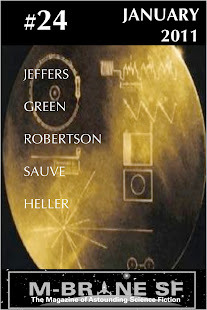 However, I shall endeavor to update the site this week. And thanks again, Chris!